You can use the Photos adjustment tools to easily change a photo’s light and color with optimal results. Using sophisticated algorithms, Photos analyzes your image and applies the correct mix of adjustments to make your photo look its best. You can also reveal detailed controls that let you fine-tune each adjustment, including exposure, highlights and shadows, brightness, and contrast. 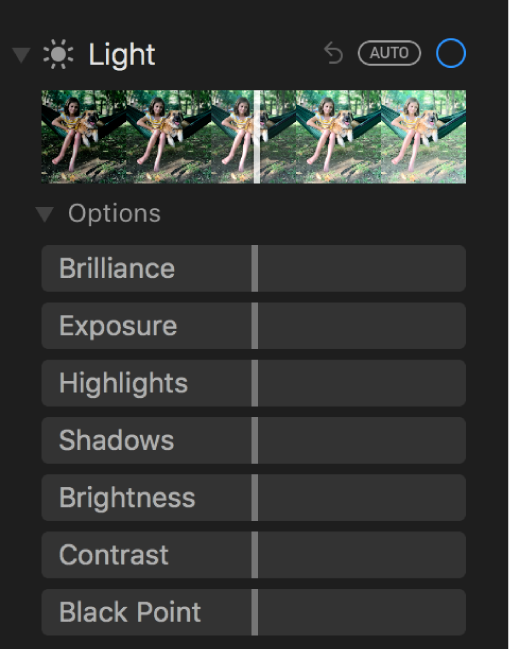 Tip: To quickly see the adjustment tools while editing, press A.
Click the disclosure triangle next to Light, Color, or Black & White, then drag the slider until you are satisfied with the look of the photo. Or, to have Photos automatically correct the photo, click Auto. Tip: To discard your changes and revert to the original settings for a specific adjustment, double-click its slider. When you make an adjustment, a blue checkmark appears next to the adjustment’s name to indicate a change was made. You can select or deselect the checkmark to turn the adjustment on or off temporarily and see how it affects the photo. You can further fine-tune the adjustments you make to the light settings of a photo. Click Adjust in the toolbar, click the disclosure triangle next to Light, then click the disclosure triangle next to Options. 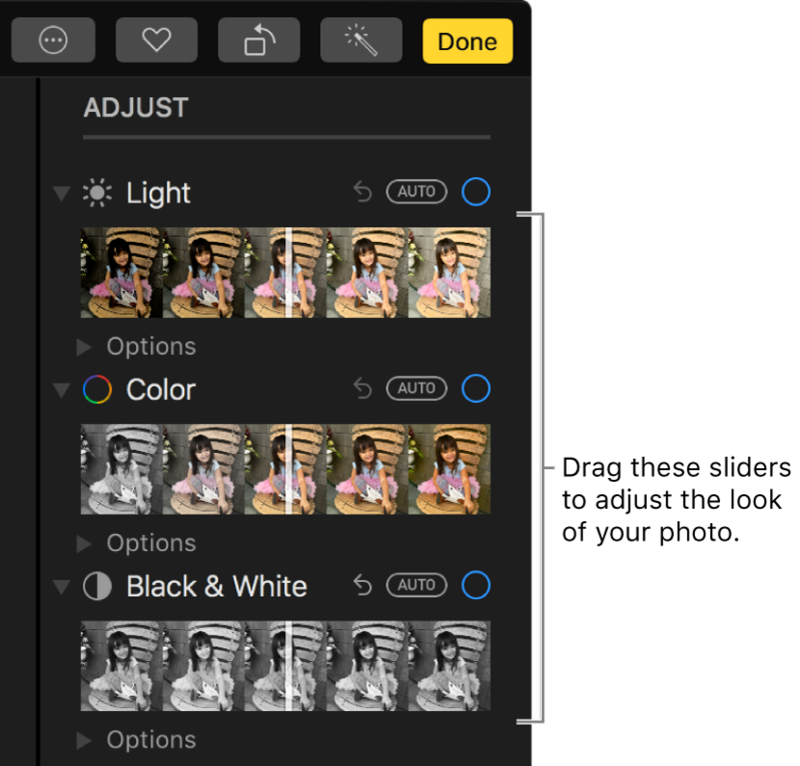 Brilliance: Applies region-specific adjustments to brighten dark areas, pull in highlights, and add contrast to reveal hidden detail and make your photo look richer and more vibrant. The adjustment is color neutral (no saturation is applied), but there may be a perceived change in color because brighter images with more contrast appear more vibrant. Exposure: Adjusts the tones of the entire image. Highlights: Adjusts the highlight detail. Shadows: Adjusts the detail that appears in shadows. Brightness: Adjusts the brightness of the photo. Contrast: Adjusts the contrast of the photo. Black Point: Sets the point at which the darkest parts of the image become completely black without any detail. Setting the black point can improve the contrast in a washed-out image. Tip: Position the pointer over a slider and hold down Option to extend the slider’s range of values. 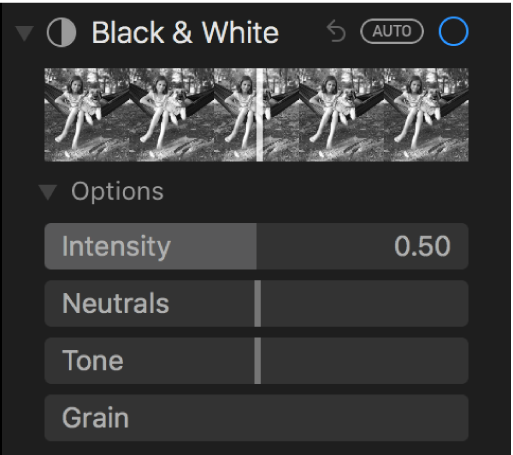 You can fine-tune the adjustments you make to the saturation, color contrast, and color cast settings of a photo. Click Adjust in the toolbar, click the disclosure triangle next to Color, then click the disclosure triangle next to Options. 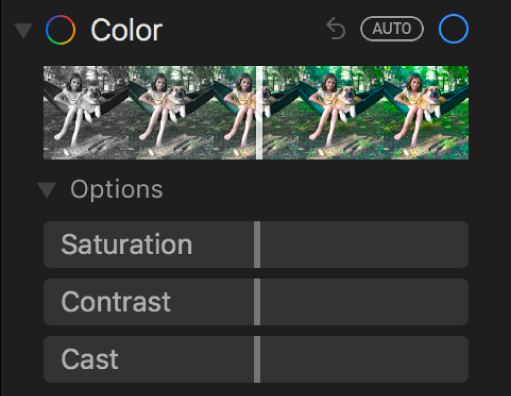 Saturation: Adjusts the photo’s overall color intensity. Contrast: Adjusts the color contrast and separation between similar colors in the photo. Cast: Adjusts and corrects for color cast in the photo. You can fine-tune the intensity of tones and gray areas, and change a photo’s grain. Click Adjust in the toolbar, click the disclosure triangle next to Black & White, then click the disclosure triangle next to Options. Intensity: Increases or decreases the intensity of the tones of the photo. Neutrals: Lightens or darkens the gray areas of the photo. Tone: Adjusts the photo for a more high-contrast or low-contrast look. Grain: Adjusts the amount of film grain that appears in the photo.